Auckland: Moved from the Museum to Albert Park in late 1909, and was affected by rapid tree growth and urbanisation during the next 20 years. Masterton: Early unofficial records were maintained fitfully by various individuals, but the first visit by the MetService was in 1928. In his 1981 thesis dealing with the reliability of weather station data, Dr J Salinger describes the pre-1920 record as “only fair”, and “must be viewed with caution”. Wellington: Moved from Bolton St to Buckle St (location uncertain) to Thorndon to Kelburn during 1906-1927, all with different aspects, exposures, elevations and urban heat island (UHI) effects. There were no nearby stations for comparisons. Nelson: The station at the Vicarage 1907-1919 was “very much sheltered, practically under a hedge overgrown by large trees”, so readings were taken over by the Cawthron Institute. These were “not very good at first” but were approved in 1928, before the station moved out to Appleby in 1931. Hokitika: Was noted for grossly inaccurate readings in 1912, as well as 1919 and 1926. The enclosure was twice criticised as too small and was greatly expanded in 1928. Lincoln: Dr Salinger’s thesis warns: “The record from 1927 is reasonable for further climatic change analysis; the record prior to 1927 should be used with caution”. In most of these cases, the problem is just poor data, and nothing can be done about that a century later. The only potential remedy is to excise the flawed periods and replace them with intelligent guesses about what the readings ought to have shown. But a little bit of this goes a long way — too many guesses and the record becomes a hypothesis rather than empirical data. So how would an analyst go about estimating the missing temperature data in, say, Masterton or Nelson? A technique described in Peterson et al (1998) — the main authority provided on NIWA’s website — would manipulate data from several neighbouring stations that are climatologically similar to the subject station. But in those early years, no such benchmark stations existed in the Wairarapa or the top of the South Island — or anywhere else in New Zealand for that matter. 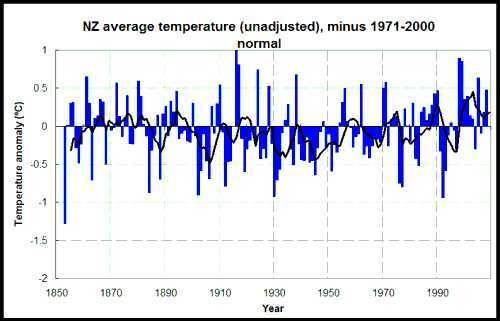 Hessell notes that “many New Zealand climatological stations were established about 1930, there being only a few with unchanged sites and unbroken records before that date.” The clear implication is that data is just too scarce in the pre-1930 period. The difficulty with early period records is further illustrated by NIWA’s Eleven-station Series. Although a representative sample would include at least six from the South Island, NIWA was unable to cobble together three until 1944 and had to wait until mid-1948 for a fourth. Then it was another six years until data from these was available for any two successive years. Using some legerdemain known only to Government scientists, NIWA claims that the 11SS begins in 1931. The 7SS should begin at the same time. So why does NIWA bother stretching the temperature record over this wasteland of missing and unreliable data, when all seven stations are isolated islands? What purpose is served by the extra decades? A time series commencing in 1930 would offer 70 years — more than sufficient to fine-tune the computer models. The series would start in 1930. As this is one of the coldest years in the entire record, the start date should help the warming trend NIWA is seeking. The 7SS could coincide with the (alleged) 11SS. All of the post-1975 years of alleged CO2 effects on temperatures would still be included. The number of dodgy adjustments could be reduced from 49 to a mere 16. You have completed NIWA’s review for them. How come they’re taking so long? Wouldn’t that be 80 years and counting? 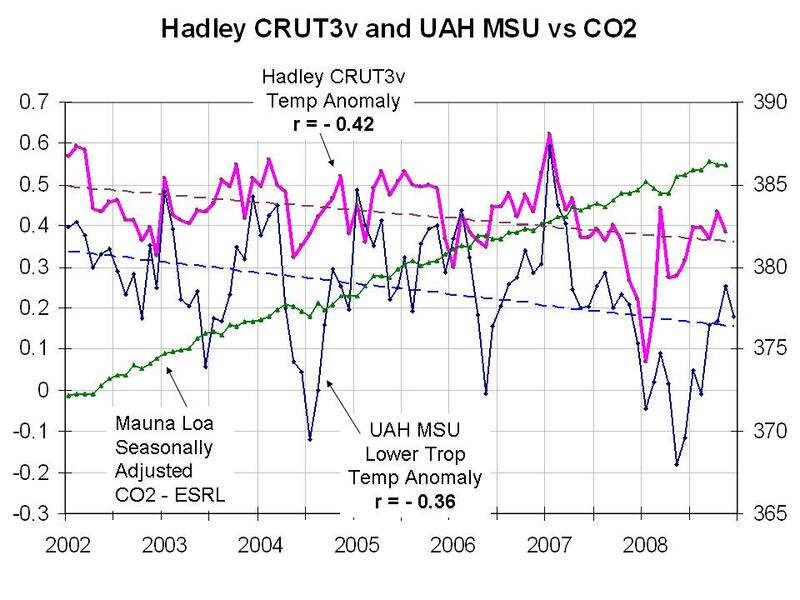 The first graph above would look great framed and hanging on the Climate Change office wall. They’ll have to do an office make-over now its the Climate Disruption office anyway. A question I have on the 11SS is: why did they not use Te Aroha? It spans all the years from 1888 to 2000, and was specifically mentioned by Hessell as a site unaffected by urbanisation, screen changes or sheltering. Perhaps the answer lies here: the long-term trend of this station is just 0.23ºC/century. Yes, and that station may be adequate for the entire NZ series given Hansen can extrapolate 1200 km in the Arctic. All of the warming in the last 30 years occurred in a single year. I will add that the peak at the end (of the top graph) looks like the1998 El Nino period. Perfect! You’ve a good ear, Richard C.
Can anybody declare this statistically valid, or does it break a rule? Not so much statistical but more a climatological phenomena. I ‘m actually more for Pielke’s Ocean Heat Content Q as a better metric than mean atmospheric temp in C.
Or even below ground temperature. If the ocean drives temperature (not CO2), we should look there first then look to see what that does to atmospheric temperature IMHO. Super-parameterization using a cloud resolving model (CRM) produces negative net cloud forcing of -1.77 Wm2 from the SP-CAM but that doesn’t seem to change model climate sensitivity much. Okay, CS is less than most conventional models (including NIWA’s UM I think) but still on the fringe (C89 is Cess 1989). The climate regime shift is only made apparent by NH data, its imperceptible (to me) in the SH data. The SH plot is more like the unadjusted plot at the top of your post. So NIWA “adjust” to be consistent with NH data – not SH. A SIMULATION that is NOT SIMILAR to the observed condition is NOT a SIMULATION. The 19 natural forcings only “simulations” that were submitted to IPCC AR4 were unable to replicate 1930’s and 1990’s warming. “fact” ? – Bollox ! The reason the “natural forcings only simulations” failed was the inept, selective and deceptive use of said forcings (the only IPCC natural RF is solar). But TSI was also reducing 1994-1997 so the IPCC solar RF will not produce the requisite warming for the next period. Not a good look for CO2. Re Ocean Heat Content climate metric and ARGO. More on the “missing heat” and model simulations. ” As many authors have noted, knowing FOHC [ocean heat content] is important because of its close relationship to FTOA, the net inward radiative flux at the top of the atmosphere. Wetherald et al. and Hansen et al. believe that this radiative imbalance in Earth’s climate system is positive, amounting recently  to approximately 0.9 W/m2. Pielke  has pointed out that at least 90% of the variable heat content of Earth resides in the upper ocean. Thus, to a good approximation, FOHC may be employed to infer the magnitude of FTOA, and the positive radiation imbalance should be directly reflected in FOHC (when adjusted for geothermal flux ; see Table 1 caption). The principal approximations involved in using this equality, which include the neglect of heat transfers to land masses and those associated with the melting and freezing of ice, estimated to be of the order of 0.04 W/m2 , have been discussed by the present authors . More on IPCC simulation assumptions and climatology complexity. be one way to test some of these models’ features before putting any faith in them. So what is the trend for the 1930-2000 period of the Seven-station Series spreadsheet? Is it still 0.9°C/century? So, if the first 30 years are omitted, what effect does that have on the Seven-station Series? Is the 1930-2000 period of the 7SS spreadsheet still about 0.9°C/century?